This blog details the recording and music production projects undertaken since Summer 2010 in the Reid Studio of the Music Department at the University of Edinburgh, UK. The blog admin is Michael Edwards. 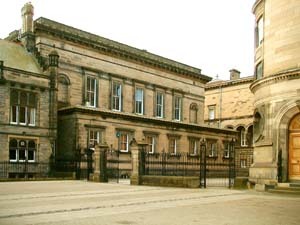 The Reid Concert Hall in Bristo Square–one of the university’s most attractive listed buildings–houses an internationally esteemed Museum of Instruments and the ‘Music Classroom,’ a concert hall with an exceptional acoustic. 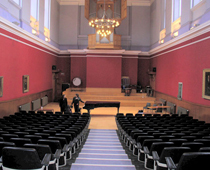 Offering an organ considered to be one of the finest of its kind in the UK as well as two Steinway D concert grand pianos, the Reid Concert Hall provides an outstanding and coveted recording space for music of virtually any genre and aesthetic. The studio is housed in the basement and has point-to-point cabling from the hall to the mixing desk/patch bays. It was designed in 2009/2010 by Michael Edwards, Kevin Hay, and several expert postgraduate students and colleagues. Funds of £120k were generously provided by the University of Edinburgh College of Humanities and Social Science and the School of Arts, Culture & Environment.